Is there a departure tax in the country I am visiting? Costa Rica – officially, the Republic of Costa Rica (República de Costa Rica) – is a country in Central America. It’s bordered by Nicaragua to the north, Panama to the east and south, the Pacific Ocean to the west and south and the Caribbean Sea to the east. The travel industry has quickly become one of Costa Rica's main economies. It has gained special favour among "green-minded" or eco-travelers. In recent times, electronics, pharmaceuticals, financial outsourcing, software development, and ecotourism have become the prime industries in Costa Rica's economy. High levels of education among its residents make the country an attractive location for investors. Since 1999, tourism earns more foreign exchange than the combined exports of the country's three main cash crops, which are bananas, pineapples and coffee. In 2008, the Environmental Performance Index ranked the country 5th in the world and 1st among the Americas. Spanish; English is also widely spoken. Costa Rica features a wide range of stores offering merchandise made locally or imported from other Central American countries. Most prices are fixed, and bargaining is recommended only with street vendors or in public market places. Boasting a wide diversity of eco-climates and settings, Costa Rica is attractive to travelers seeking beaches, tropical forests, active volcanoes, mountain settings, and a wide array of activities. Surfing, canopy zip-lining, hiking, birdwatching, and fishing are some of the most popular draws. The climate of Costa Rica is characterized by two seasons – the rainy season extends from May to November and the dry season from December to April. Costa Rica is a tropical country situated between 8 and 11 degrees above the equator. So, it has only two seasons: dry and green (or wet)! The dry season is generally between late December and April and the green or wet season lasts for the the rest of the year, from May through November. Even during the rainy season, visitors can still enjoy an average of about 5 hours of sunshine daily. Temperatures vary little between seasons. The main influence on temperature is altitude. San José at 1150m has a climate which the locals refer to as the "eternal spring". It has simply delightful weather all year around! Average temperature ranges in San Jose are from 14 to 24°C in December to 17 to 27 °C in May. The lower level, sea level coasts are even warmer, with the Caribbean averaging 21°C at night and over 30°C during the day. The Pacific coast is a few degrees warmer still; but the humidity is generally less, so it tends to be more comfortable. The Northern Pacific Region is referred to as the "Gold Coast" and has an abundance of large resort hotels because of the drier and sunnier climate. Arenal Volcano, in Spanish Volcán Arenal, is an active andesitic stratovolcano in north-western Costa Rica. The Arenal volcano measures at least 1,633 metres. It is conically shaped with a crater spanning 140 metres. Arenal is geologically considered a young volcano and the age is estimated to be less than 7,000 years. Corcovado National Park is a National Park on the Osa Peninsula in the South West of Costa Rica. It was established on 24 October 1975. It is widely considered the crown jewel in the extensive system of national parks and biological reserves spread across the country. National Geographic has called it "the most biologically intense place on Earth""." Manuel Antonio National Park is a small National Park in the Central Pacific Conservation Area located on the Pacific coast of Costa Rica. Established in 1972 with an area enumerating 4,014 acres, it is the destination of as many as 150,000 visitors annually and well-known for its beautiful beaches and hiking trails. Grecia is noted for its unique church, Iglesia de la Nuestra Señora de las Mercedes, that is made entirely of pre-fabricated steel plates painted red. According to an urban legend, the church was donated by some foreign country, and sent to Greece as a gift, but was wrongly shipped to Grecia. Tortuguero National Park is a National Park within the Tortuguero Conservation Area. The reserve is also included in the Humedal Caribe Noreste, a wetland of international importance under the Ramsar Convention. 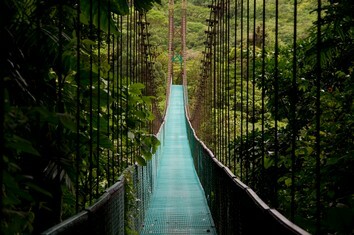 It is the third-most visited park in Costa Rica, despite the fact that it can only be reached by airplane or boat. In Monteverde Costa Rica rain forest are found more than 100 species of mammals including 5 species of cats, over 400 species of birds including 30 kinds of hummingbirds, tens of thousands of insect species and 2,500 species of plants. The area is acclaimed as one of the most outstanding wildlife refuges in the New World Tropics. Playa Tamarindo, located on the Pacific Coast, has much to offer besides its crystal clear ocean, exquisite nature and stunning sunsets. Go surfing, fishing, and many other activities and tours, stay at a friendly bed and breakfast, luxurious hotel, the options are endless. Cahuita National Park is a National Park in the Caribbean La Amistad Conservation Area of Costa Rica. It protects beaches and lowlands and attracts tourists and other visitors who are able to scuba dive and snorkel in the protected marine area which contains the Coralline Reefs, as well as being a nesting ground for sea turtles. Jacó is a coastal city in Costa Rica's Puntarenas province, located in the Central Pacific Region, on the shores of the Pacific Ocean. Jaco has become a very popular tourist destination for not only native Costa Ricans but also foreign travelers. It lies between several mountains, and encompasses the beaches of Herradura, Jacó and Hermosa.